I'm pretty late on reading this one. 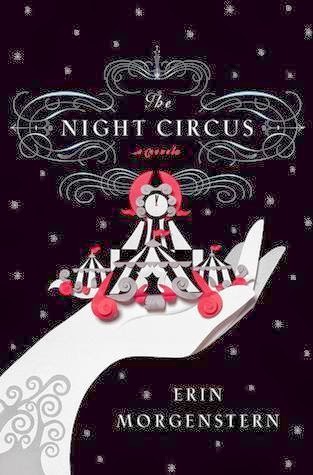 I purchased The Night Circus, written by Erin Morgenstern, about two years ago when it was rising in popularity, and it has spent those last two years gathering dust on my book shelf. It wasn't until three weeks ago that the book suddenly caught my attention and I knew the time had finally come to read it. But behind the scenes, a fierce competition is underway: a duel between two young magicians, Celia and Marco, who have been trained since childhood expressly for this purpose by their mercurial instructors. Unbeknownst to them both, this is a game in which only one can be left standing. Despite the high stakes, Celia and Marco soon tumble headfirst into love, setting off a domino effect of dangerous consequences, and leaving the lives of everyone, from the performers to the patrons, hanging in the balance." As stated in the book description, The Night Circus is about a competition between two magicians, Celia and Marco, that takes place amongst a traveling circus. There's magic, mystery, and romance. Overall, the story is interesting. The rules behind the competition start off fairly vague. All you know is that the competition starts off when Celia and Marco are both children and continue into their late-teen years. And though it is slightly predictable, I was still very much interested to watch the story unfold. At the beginning of each chapter, you get a time stamp that also indicates location. Using this, The Night Circus tells its story through two different timelines that will eventually merge to tell one complete tale. I liked this component quite a lot. When I initially started reading this book, I thought Erin Morgenstern's writing was very eloquent and beautiful. But by the time I was about a quarter of the way through the book, it started to feel a little too heavy and pretentious. This feeling never went away, and by the time I finished the book, I was very much tired of the style. I did not like the romance at all. Let me quickly mention that, in general, I'm not a huge consumer of romance novels (the ones with shirtless, ripped guys on the covers). I like romance stories, just ones that you can watch slowly develop on the page. The romance in The Night Circus was just majorly underdeveloped and unbelievable. It was one of those "instant mysterious attractions" that have no foundation for believability. Luckily, the romance parts didn't really come into play until the latter half of the novel. However, when it finally did, I felt the novel suffer dramatically. I enjoyed this book- especially the first half. I liked the two different timelines being told, and the magical realism element was intriguing. However, the writing style got overbearing, and the romance dragged down the rest of the story a lot. Considering all of this, I would give the book 2.5 stars out of 5. I had fun, but I wouldn't read it again, nor would I recommend to this any of my friends.